AFC at the AIA 2016! Acoustics First® will be exhibiting at the AIA Convention next week, May 19th-21st, in Philadelphia. If you’re in town, be sure to stop by the AFC booth and meet acousticians Jim DeGrandis and Cameron Girard. They’ll be featuring our industry leading Art Diffusor® series along with other product offerings. 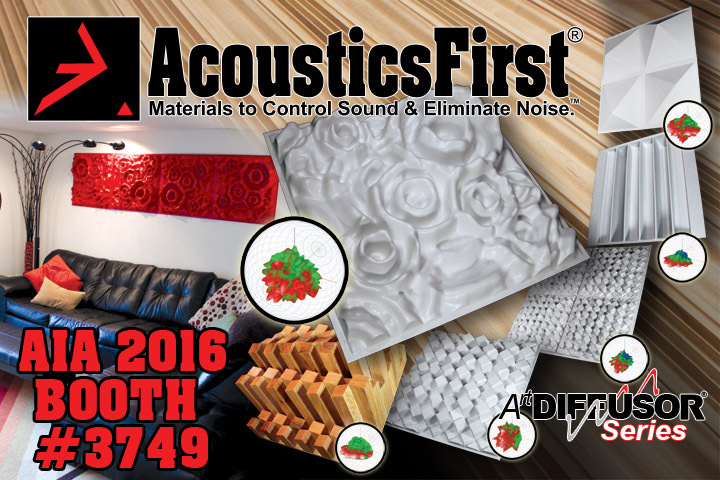 Acoustics First @ AIA Philadelphia 2016 – Booth 3749 – Keep an eye out for our Banner! Since the 1980’s, the principals of Acoustics First® have been designing, manufacturing and distributing a wide variety of acoustical materials, ranging from industrial blankets to premium acoustical ceiling tiles. This year we’re particularly excited to share our latest developments in the world of sound diffusion. This includes the creation of a method to evaluate sound diffusers using particle computer simulations, utilizing 3D printing technology to streamline the development of new diffuser prototypes, and a new comprehensive set of data which allows the performance of our sound diffusers to be compared. Swing by and check out all these innovations first hand, or just hang out and shoot the breeze with our acousticians. We look forward to seeing you at AIA Philadelphia! This entry was posted on May 10, 2016, 3:41 pm and is filed under Uncategorized. You can follow any responses to this entry through RSS 2.0. Responses are currently closed, but you can trackback from your own site.